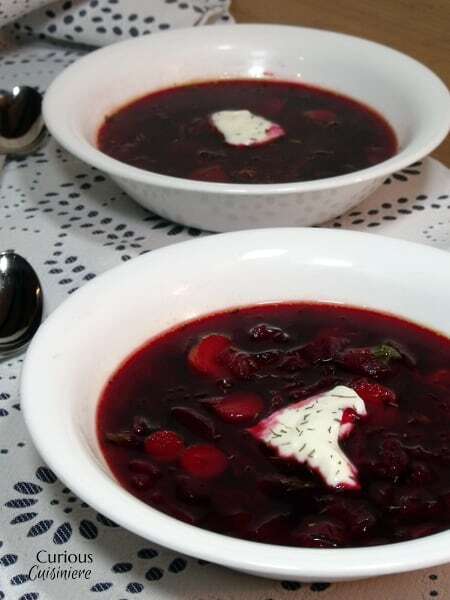 Our Polish Borscht recipe (Barszcz) creates a beet soup that is chock full of veggies and boasts a bright, sweet and sour flavor making it a perfect first course or warming meal. 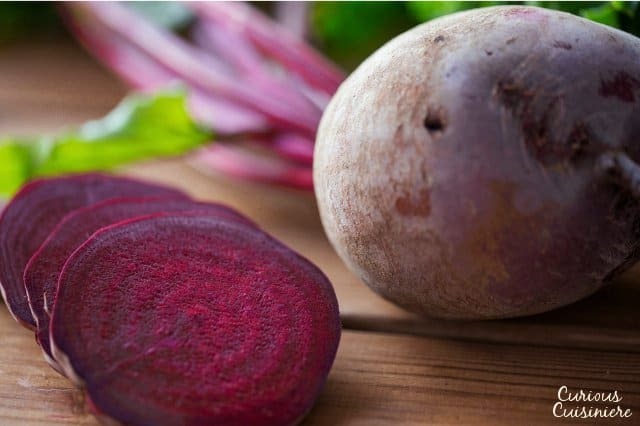 Don’t you just love the beautiful color beets give to everything they come in contact with? Well, maybe not your fingers. Then it’s a little disconcerting when the red just won’t come out. But to everything else, beets bring such beautiful color! 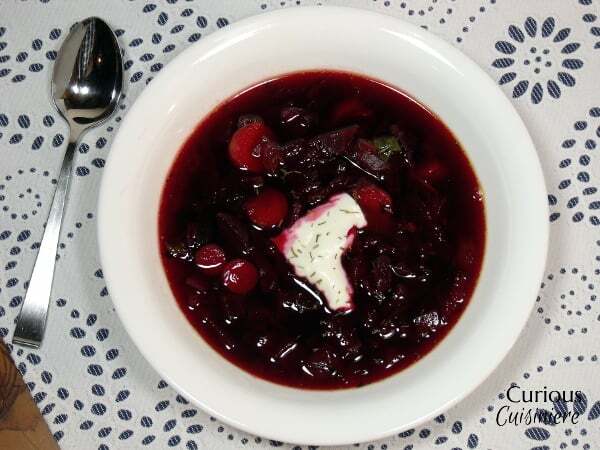 Especially to a comforting bowl of beet soup! 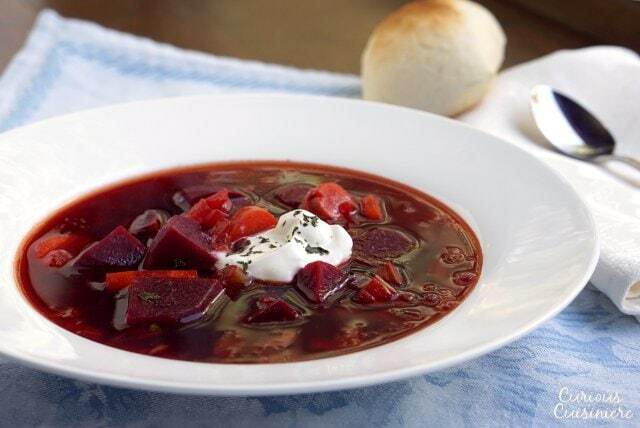 Borscht is a popular soup in many Eastern and Central European countries. 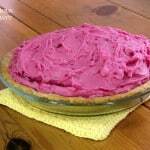 And, while the soup’s ingredients (and spelling) vary by region, beets are the common thread throughout. Ukrainian borsch, which is thought to be the original, includes potatoes, mushrooms, cabbage, tomatoes, and a variety of beans. Russian borscht will commonly include cabbage and potatoes, as well as meat. The basic Polish barszcz includes onions, garlic, carrots, and celery. Often for Polish barszcz, the soup is strained after cooking to produce a pure, red broth. This glassy broth is eaten with uszka, or mushroom-filled dumplings. It is this version of borscht that is commonly found on a traditional Polish Christmas Eve dinner tables. But that’s not the version of borscht we’re talking about today. Since we like our soups hearty, we’ve left the veggies in our Polish borscht. 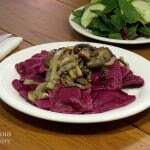 Peeled and cubed beets are cooked with a variety of vegetables, giving of a beautiful color and wonderful aroma. Apple cider vinegar gives our barszcz its characteristic sour flavor, and nicely plays up the sweetness of the beets. Borscht really is such a simple soup to make. Some recipes will have you cook your beets first by either roasting or boiling, before peeling them and adding them to the soup. We prefer to peel the raw beets and cook them right along with the rest of the veggies, in the traditional Polish fashion. 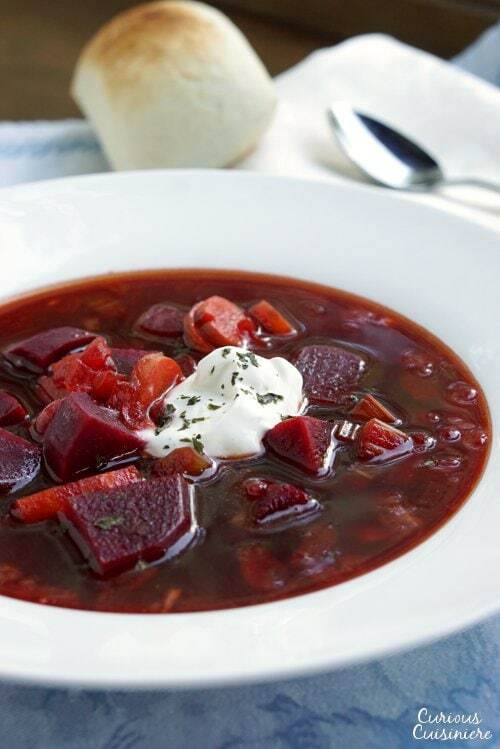 Not only do you skip a step, making this soup come together incredibly quickly, the raw beets add such a beautiful, deep color to the borscht. Since we like to keep our veggies in our beet soup, it’s hearty enough to serve as a main dish along with a good, fresh loaf of really crusty bread. If you’d like to serve this soup as a first course or appetizer, smaller servings work great. 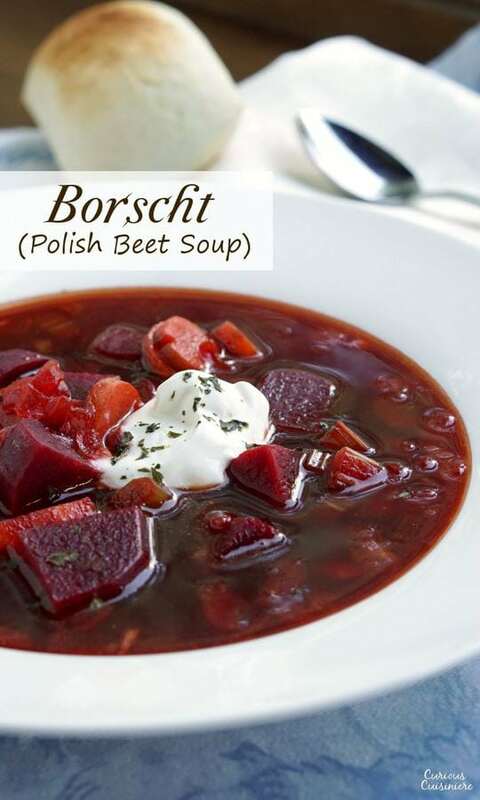 Or, you can strain out the veggies and serve the clear borscht in a more traditional Polish fashion as a first course. 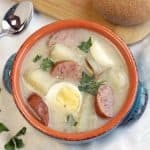 First course or main dish, a dollop of sour cream in your bowl adds a nice bright contrast and a creamy smoothness to round out the texture of this flavorful, brothy soup. If you’ve never tried beet soup, you really must! It’s a winter staple in our house! 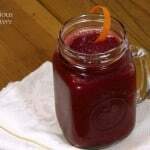 And, if you can’t get enough of those beets, try this chilled beet soup for warmer days! 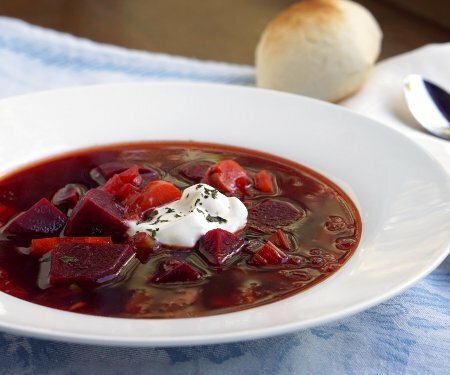 Our Polish Borscht recipe (Barszcz) is chock full of veggies and boasts a bright, sweet and sour flavor that makes it a perfect first course or warming meal. Melt butter in a large soup pot. Add onion and garlic and cook over medium high heat, until the onion is soft (5 min). Add beets, carrots, celery, allspice, and bay leaf. Stir to coat with butter. Add stock and bring to a boil. Cook until the vegetables are tender (10 min). Remove the pot from the heat. (If desired, you would strain the vegetables from your borscht now.) Stir the vinegar, sugar, pepper, and salt into the broth. Taste and adjust the salt and pepper as desired. Serve with a dollop of sour cream and a sprinkling of dill, if desired. This recipe from 2013 was updated in October 2017. We made the soup even tastier! Enjoy! My first time making this recipe, and it was CRAZY good. I used beef bone broth and left out the garlic, onion, and sugar (health reasons), and I was afraid that was modifying the recipe too far, but it was amazing. Eleven out of ten. Thanks for the great recipe! So glad you enjoyed it Kathryn! My Polish mother-in-law used pickle juice instead of vinegar. That sounds like it would be tasty! 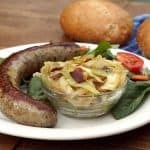 One of the better borshch recipes I’ve tried. I used a home-made pork leg and beef bone broth, and used double the vinegar because I like it tart. If you’re serving this as leftovers, add just a tad more vinegar or lemon juice before serving, since overnight the broth tends to bland a little. Thank you Alaina! Great tip! 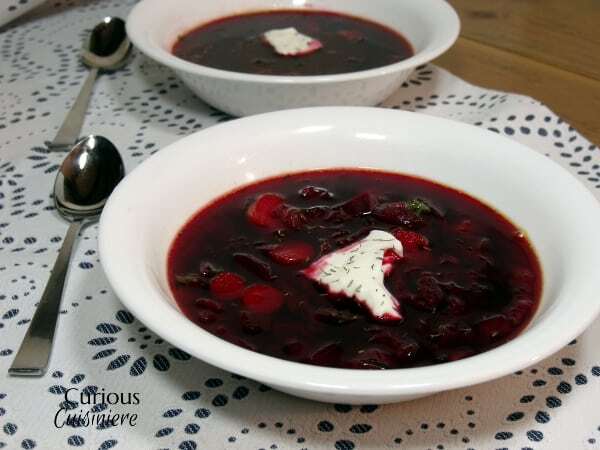 There is a variety of Ukrainian borscht – meatless, summer borscht with sorrel, but except for the latter, they all have beets. along with a chuck-full-of-veggies. 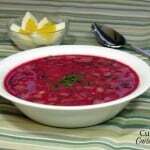 How could you leave the beets out in your description of the Ukrainian borscht when they are so vital. in the making of most varieties of Ukrainian borscht? I will try the Polish borscht, recipe you listed, which is very similar to the one my Mother, who came from Donbas, Ukraine, used to make. Hi Tanya, You are correct. 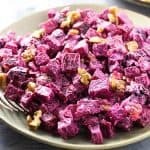 As our article says, “beets are the common thread throughout” the different countries’ borscht versions. In the list, we were giving some of the ways the different countries’ ingredients vary. Enjoy! I made this recipe. It was absolutely amazing! Very rich flavor and the all spice really added to the overall flavor. Will definitely make again. Wonderful! We’re so glad you enjoyed the borscht! 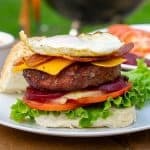 This looks delicious, I might have to change it up just a tad and add some chuck steak. I’ll let you know how it turns out, thanks for sharing! Sam! Sounds delicious! We can’t wait to hear how it turns out! Born bred raised in the USA- Polish on both sides of the family. I now live in Poland, and your recipe(s) were SPOT ON!!! Just a suggestion-also may add a nice chunk of pork, or beef on the bone!! DELISH!! AND you even SPELLED it correctly in Polish!! Na Zdrowie!! Thank You Dona! We appreciate your comment. What a beautiful place to live! We hope to get back there some day. We’ll be trying some beef or pork in our barszcz the next time we make it! My grandmother and mother always added beef to the broth when making Borscht. I don’t make it often enough, as not everyone in my house likes beets. Although this recipe is making me hungry for it. Great recipe..so delicious.. I just made this Barszcz and it brought back memories. My mother was Polish and I used to watch her as a child making her style of Barszcz so similar to yours. So glad you enjoyed the recipes! What great memories! My Polish Grandmother would serve a bowl of whole boiled potatoes at the dining table. After the soup had been served the potatoes were passed and one could be added to your bowl. Delicious and very colorful. Sour cream a must! What a wonderful way to serve it! I didn’t have bay leaves or allspice, so I used a dash of clove powder and left everything together (no straining) . It tastes great! Thank you! So glad you enjoyed it Mahala! Instead of beef broth, I reserved and filtered 1 cup of the boiled beet water, then put 2 cups of chicken broth and 1 cup of red wine. It was amazing!!!! So glad you enjoyed it! Thanks for sharing! Ooh I love the gorgeous color of your soup!We love our beets here and I would love to try your recipe.Only thing is we don’t eat beef 🙁 Can I use Chicken stock instead or add red wine?Thanks! I think chicken stock or vegetable stock would would a good substitution. The red wine would probably be really good, but it would change the flavor quite a bit. That gives us ideas though! Hope you enjoy it!